Luton boss Nathan Jones was disappointed to miss out on the League One manager of the month award for October to Coventry City’s Mark Robins last week. The Sky Blues chief took the gong after a month in which they started out losing 1-0 to Portsmouth. We’re disappointed as a group to not have got it as we don’t think we were rewarded for the month we had. They then won their next five in the league though, with victories at Charlton, Southend and Bradford, beating Wycombe and Doncaster on home soil. That saw them take 15 points from a possible 18, while in between was a 1-1 Checkatrade Trophy group stage draw with Forest Green Rovers, although City triumphed 4-2 on penalties. 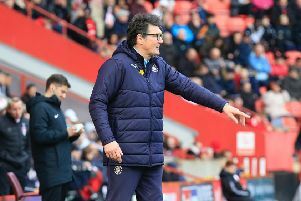 Luton also claimed 15 points, with five successes from six, seeing off Scunthorpe, Walsall and Accrington at home, with away wins over Oxford and AFC Wimbledon, as they lost to Barnsley in between, also beating MK Dons 3-0 in the Checkatrade Trophy. Jones said: “To be honest with you, I like having the manager of the month. “It shows you’re doing good work and our month was I think better than theirs, so they (judging panel) must have thought something. “We both had five wins in the league, we scored 15 goals, they scored 11, so we had a really good month. “We won our Checkatrade game, they didn’t, so in theory we had a better month than them, so I don’t know. Jones also went on to admit that return Luton amassed, taking them to fifth in the table, was ahead of even what the players had expected, as he added: “We exceeded every target that the players set last month, and they set a real bold target. “Because the points, the goals, the clean sheets, the cup wins, where we would like to be in the league, at the start of the month, we surpassed every single target. “It’s not often I settle for stuff, but I would have settled for the points target and everything they set, but we exceeded all those expectations.